LED line features a color rendering index of 80 and color temperatures of 2,700K, 3,000K, 3,500K and 4,000K. The Halo LED H7 Collection is designed for new construction projects or to retrofit existing 6-inch nominal compatible housings (with an Edison screw base adapter included with the module). 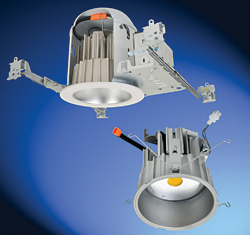 The downlights are designed to deliver greater than 70 percent of initial lumens at 50,000 hours and offer a full range of dimming capabilities.